I’ve been on a journey for a bit now – and it’s by no means over. There’s still such a long way to go. I’ve always been a big reader. From an early age, after mum and dad kissed me goodnight and turned the lights out, I would grab a torch and under the covers I would read until I fell asleep. But lately my reading has been focused on books of a metaphysical nature – and as a number of you have privately asked me to recommend books for you to read, I thought I’d do a post of the books that have had an impact on my spiritual growth. So here they are, in (very rough) order that they came to me. It starts with a book I found in the drawer of the bedside table of a Tokyo hotel in 1970. I had just turned 17. 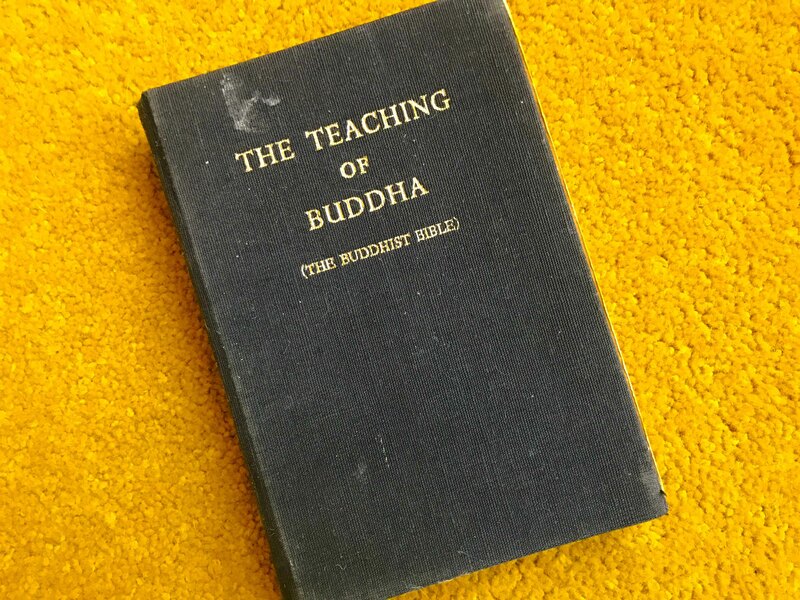 It was a Buddhist Bible, and it would have a profound effect on me in the years and decades to come. I then began to study Buddhism, and discovered Dr. Walpola Rahula’s What the Buddha Taught. It became my companion for many years. And that led to other books on Buddhism, then onto Hinduism, and meditation, and later yoga, and so on. As I said, this is not a comprehensive list, nor does it include many works that have helped me enormously along the way. And as you can see from this list, there are big big gaps in my knowledge and reading. I have only really dipped into the Saint Germain series for instance, and I have yet to read Baird Spalding’s Life and Teachings of the Masters of the Far East. There is so much for me to catch up on, and learn. I am currently finding Paul Selig’s series of books incredibly powerful and transformative – but I couldn’t have really got what they are saying without having first read Amanda Guggenheimer’s The Light Worker’s Companion, and before that, Tony Stubbs’ Ascension Handbook. I’m finding that the right book comes along when it’s needed. Having just finished Paul Selig’s Book of Knowing and Worth, I’m now currently reading Deepak Chopra’s The Higher Self. Julian – love it! No wonder you are who you are! Big hug mate. Btw, currently watching replay of Man United Liverpool match. Cracker game! Btw, I didn’t post my non esoteric books. Some are on your list! It is impossible for me to publish the full list of books that have contributed to my own Spirirituality, let alone anything else — there are just so many of them !! To give some perspective, that list of mine is much less than 1% of what I’ve read ; the list is instead a shorter list of works that I believe to be helpful towards a more general grasp of what Spirituality means in a Western context and Culture, and yes that does include the Astérix books and the Jack London ones etc. I’m not sure that “the esoteric” has any particular value — over-valuing it tends to promote the false notion of “special people”, who have “special knowledge”, in opposition to the actual Truth which is that Spirituality is the preserve of everyone, in the Gift to us of our Souls from God, and not the reservation of some sort of Elect. By comparison, Gérard Genette’s collections of literary criticism essays, Figures I, Figures II, Figures III, Figures IV are most certainly esoteric, but their esotericism provides in itself very little in terms of any Spirituality at all. In my list, Astérix en Corse and Umberto Eco’s Lector in Fabula are equally useful, each in their own very different way, to denounce esotericism (which really is just a cult of the secret) as a vice. Monaco thrashed Marseilles 4-1 last night at their place (was a 4-0 in the first half of the season), and reclaimed the top of the League Table from Nice. The first half of that match is superb, on the part of both teams, but quality did start to flounder after Marseilles suffered their 4th. Monaco have scored 85 times total so far (60 in the League fixtures), a staggering performance matched in the past 10 years in the major championships only by Real Madrid and the Barça. I will have to keep an eye out for their games on my cable channel Bein. I think they carry your league. That’s very pleasing though. When your footy team does well, it really lifts you. I read White Fang and Call of the Wild. It’s a start. I haven’t read either of those books Steve, so you’re ahead of me mate! Julian has been busier than me Britta! With most of his books you need a PhD from the Sorbonne to read them! !